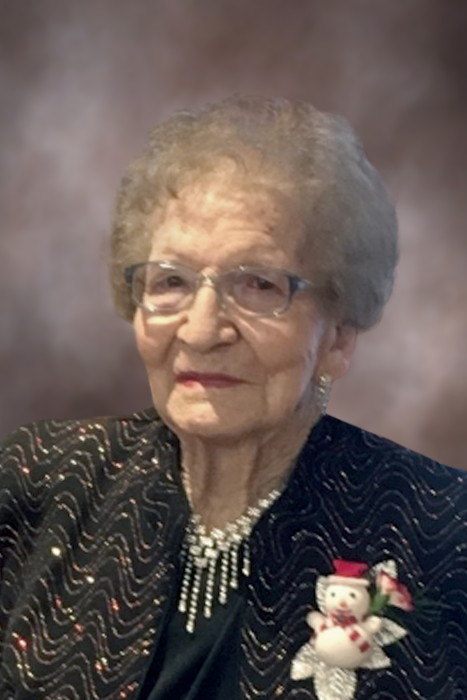 Obituary for Marie Schmaltz | Binkley's Funeral Service Ltd.
Marie was the eldest child of five children born to Vincent and Eva Mastel of Liebenthal. Growing up she attended Nicefield School and, along with the family band, played at barn dances. Marie enjoyed playing her banjo. After leaving home, she then moved to Medicine Hat where she met and married Peter Schmaltz in May, 1959. They moved to the Schmaltz farm at Fox Valley where she resided until May, 2018 when health problems forced her move to the Western Senior Citizens Home in Leader. Marie was a great gardener and always had the yard full of flowers. She spent hours driving around, either visiting friends and family or just checking the farm. The greatest love of her life was her family. She loved to prepare meals, basically feasts, for all. Marie was predeceased by her parents, and siblings: Rose (George) Thome, Chris (Joe) Stappler, Ann (Ernie) Hildenbrand, and Andrew (Josephine) Mastel; her in-laws Rose (Vincent) Riffel, Ann (Peter) Materi, Alex (Mary) Schmaltz, Betty Donison, and Margaret (Tom) Wyers; her husband Peter in 1999, son-in-law Ed Hittel in 2013, grandson-in-law Terry Ternes in 2017, and son Stewart in 2018. Marie is survived by her family Darlene Hittel, Marlene (Guy) Richer, Neila Schmaltz, Delsa Schmaltz, Colin (Colleen) Schmaltz, Cameron (Hazel) Schmaltz, Alex (Robbie) Schmaltz, Barry (Tracey) Schmaltz, 18 grandchildren, 26 great-grandchildren, 6 great-great grandchildren, and numerous nieces and nephews. Well Boss, the dogs have been run, the cows have been fed, the hen house is closed, coffee has been poured, and the family well-loved. Your work here is done. It is time to pick up your banjo and join the party in heaven.